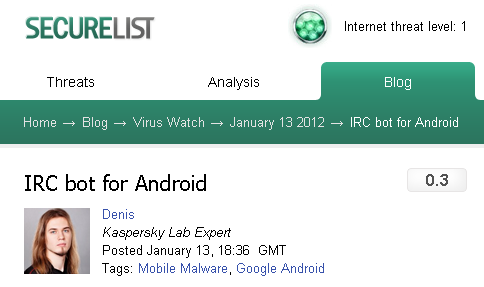 Not so long time ago we found a very interesting piece of malware for Android. Unfortunately, it is not clear how it was spread but in any case it’s worth mentioning. The malicious application displays itself as ‘MADDEN NFL 12’ game after the installation. The file size is over 5+ MB and actually is a Trojan that drops a set of malware components onto the system: root exploit, SMS Trojan and IRC bot. The .class file "AndroidBotAcitivity" maintains this dropper functionality. It creates a ‘/data/data/com.android.bot/files’ directory and sets ‘777’ permission (read/write/execute for all users). After that it extracts three files - ‘header01.png’ (root exploit), ‘footer01.png’ (IRC bot), ‘border01.png’ (SMS Trojan) - into this directory. Then it sets ‘777’ permission on the root exploit file and executes it. Finally, it displays the text ‘(0x14) Error - Not registred application’ on the screen. If the exploit is executed successfully and the device is rooted, it launches the IRC bot ‘footer01.png’. The IRC bot, after launching the SMS Trojan, will try to connect to IRC server 199.68.*. * (it was unavailable at the time of research) on channel ‘#andros’ with a random nickname. After that it is able to receive any shell commands from this server and execute them on an infected device. This is first IRC bot for Android we’ve seen so far. And what is more interesting is that comes together with a root exploit and an SMS Trojan. They work together efficiently and the cybercriminal in this case has full access to an infected smartphone and can do anything he wants. P.S. We detect all the malicious files as Trojan-Dropper.AndroidOS.Foncy.a, Exploit.Linux.Lotoor.ac, Backdoor.Linux.Foncy.a and Trojan-SMS.AndroidOS.Foncy.a.